Etienne Dupuch Jr Publications Ltd is the leading publisher of business and tourism information in The Bahamas. For more than four decades the company has created a wide range of high-quality, informative and respected publications, reliably delivered to their targeted audiences. Books, magazines, maps and travel guides produced by Etienne Dupuch Jr Publications Ltd reach a majority of vacation and business travellers visiting and living in The Bahamas. The Bahamas Investor was introduced as an international supplement to Bahamas Handbook in 2006 to serve the needs of investors and wealth management professionals conducting business in the evolving offshore financial marketplace. 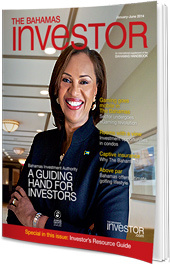 The magazine, published online and in print, focuses on wealth management strategies, opportunities for direct investment and the lifestyle advantages of doing business in The Bahamas. 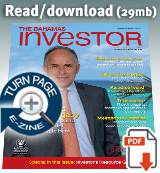 TheBahamasInvestor.com is regularly updated with our exclusive reports integrated with international press keeping readers connected, News & Press is the place to learn about FDI in the jurisdiction. The Bahamas Investor's print and online practical resource guide is designed for financial planners and other advisors to share with their own clients. 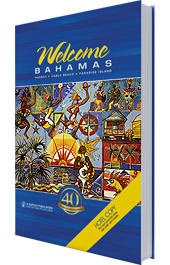 The Bahamas Handbook is the company's flagship publication, an annual book that runs to more than 650 pages. It includes full-colour photography and stories on the people, history, culture, investing, politics and the islands of the archipelago, including in-depth articles on tourism and the economy. 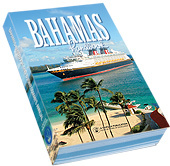 Much of the book’s reputation rests on the encyclopaedic Blue Pages -- a 200-page, A to Z compendium of the most up-to-date information available on The Bahamas today. Glossy, full colour coffee-table style hardback books. Brimming with lavish photography and interesting articles, the Welcome Bahamas books give visitors information on things to do, events, local sports and places to dine, along with sections devoted to available real estate and investing opportunities. These pocket-sized guides are packed with well-written stories about The Bahamas. Distributed free in hotels, stores and restaurants, What-to-dos include lists of events, places to stay or dock your boat, where to enjoy gambling and a rundown on the ever-changing catalogue of luxury products there is to buy at duty-free prices in The Bahamas. Also, information on US, UK and Canadian customs and duties. Even business opportunities and real estate bargains are covered. 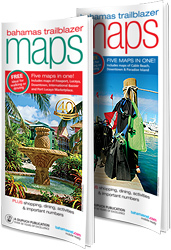 Easy-to-use maps tell readers exactly where they are and how to get to where they want to go. This popular booklet points visitors to the best places to go for breakfast, lunch and dinner. Each edition throws a spotlight on the head chefs at two restaurants, publishing their favourite recipes. There's a list of the most popular restaurants, along with information on the dress code, reservations, average meal costs and more. Night clubs, comedy reviews and stage shows are listed, along with all the places to enjoy music, from quiet piano stylings and cool jazz to sensual latin dance beats and karaoke. Lost? Even Bahamians use Dupuch Publications Trailblazer Maps to get around in New Providence and Grand Bahama Island. Accurate and easy-to-use, Trailblazer Maps are updated every January and July, showing not only streets, roads and highways, but landmarks such as forts, malls, beaches, parks and recreational areas. 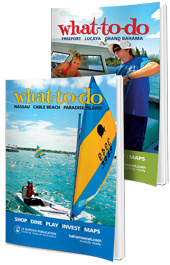 A directory makes it easy to find shopping, dive companies, golf courses, marinas, accommodations, restaurants and casinos. Important phone numbers and notes on interesting places to visit are also included in these souvenir maps. 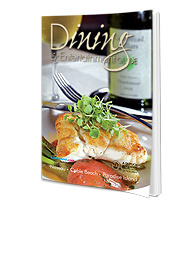 Distributed free in stores, restaurants and hotels.